After 7 months in space, the Jules Verne ATV has completed its mission after a flawless destructive re-entry guided by the ATV Control Centre at CNES’s facility in Toulouse, France. 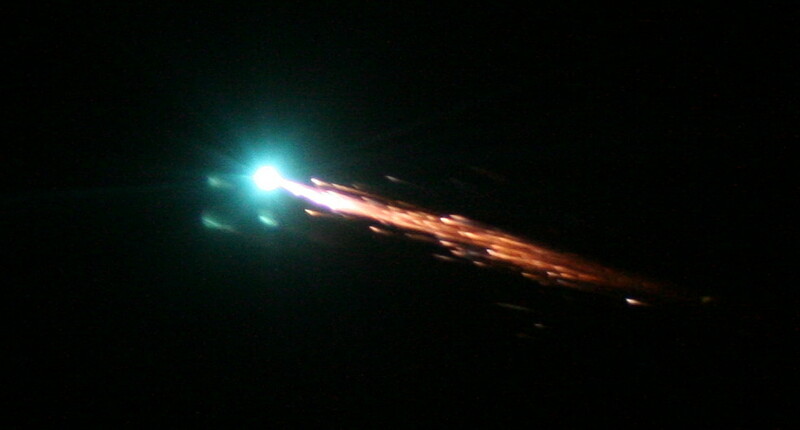 A picture of the ATV’s re-entry over the South Pacific taken from one of the 2 DC8 observation aircraft on the scene. Credits: ESA. Monday 29 September, just over 3 weeks after undocking from the International Space Station, the ATV was guided by the ATV-CC in Toulouse to a destructive re-entry over a completely uninhabited area of the South Pacific. “The re-entry operations performed here today from the CNES space centre in Toulouse mark a key step in the ATV programme and the ISS exploration programme,” said CNES President Yannick d’Escatha. 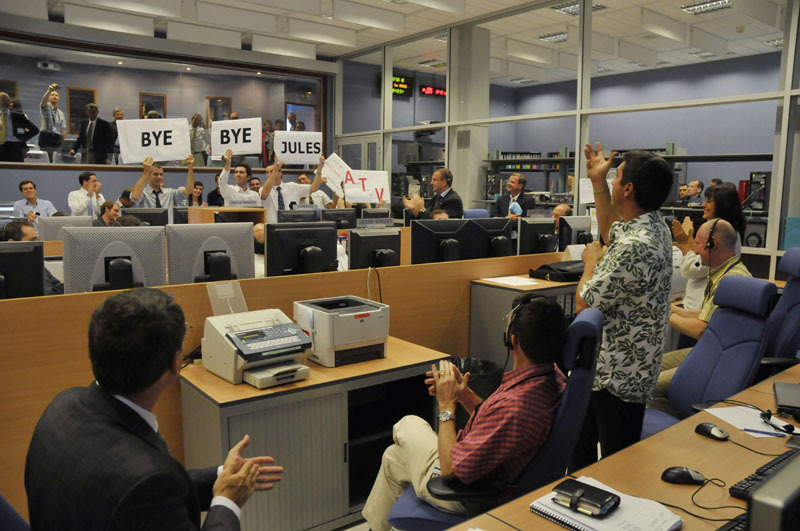 Relieved ATV-CC teams at CNES in Toulouse bid farewell to the ATV. Credits: CNES. The re-entry was performed in 2 stages: first, the ATV’s circular orbit was lowered from 330 km to 220 km; 3 hours later, a second manoeuvre brought the cargo vessel to its re-entry point. It then descended through the atmosphere at an angle calculated to carefully control the trajectory of residual debris. 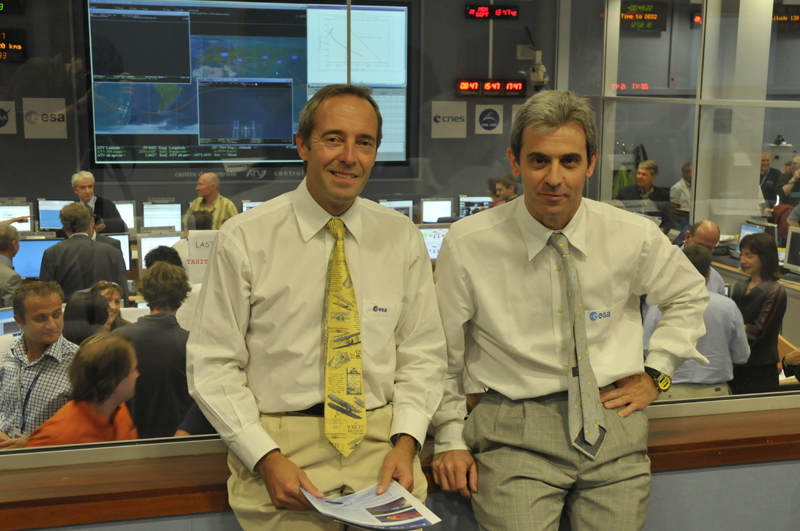 ESA’s French astronauts, Jean-François Clervoy (Senior Advisor Astronaut for the ATV project) and Leopold Eyharts, were also on hand at the ATV-CC. Credits: CNES. The destruction of Europe’s resupply spacecraft was observed by 2 aircraft over the Pacific equipped with a suite of sensors, and from space by the ISS crew using an ultraviolet spectrometer. These observations will help to devise more accurate and reliable atmospheric re-entry models for future ATV missions. ATV re-entry. Credits : CNES 2008. - 9 March: Ariane 5-ES sends ATV aloft from the Guiana Space Centre. - 29 March: Demo-day 1. - 31 March: Demo-day 2. - 3 April: Successful docking with Russian Zvezda module on ISS. - 5 April: ISS crew enters ATV. - 25 April: ATV boosts ISS orbit, the 1st of 4 such manoeuvres during its mission. - 28 August: ISS manoeuvred to avoid collision with space debris, using the ATV’s thrusters. - 5 September: ATV undocks from ISS. - 29 September: ATV burns up on re-entry.